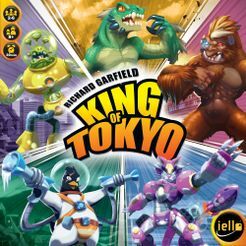 Buy King of Tokyo and PriceWatch, Buy this board game at the Lowest Price. This is a game about gigantic Japanese Manga-style monsters taking over Tokyo in comic-book fashion. To me, Gigazaur, Kraken, Kong, MekaDragon, and CyberBunny might as well be the blue, red, green, yellow, and black counters, for all the flavorful resonance they have for me. When I see a card called 'We're Only Making It Stronger' with a picture of some laser guns being pointed at a giant monster in the sky, all I see are the words 'when you lose two Health or more, gain one Energy' and that the card costs three green cubes to purchase. Before you pity me, or assume that I therefore hated King of Tokyo, you couldn't be more wrong. Despite my blindness to the flavor, this is one of my favorite games of recent times. Why? Because the blend of card and dice mechanics, with a little bit of viciousness thrown in, is pitch perfect, that's why. The game goes something like this: Your goal is to get to 20 Victory Points. Each turn, in vaguely Yachtzee-like fashion, you roll six dice, with two rerolls each turn allowed, as you try to sculpt a good 'hand'. All the dice have the same six faces: A 1, 2, 3, an Energy symbol, a Healing symbol, and an Attack symbol. Each Energy symbol gets you an Energy cube, which you in turn use to purchase one of three cards that are visible at any one time. More on these in a moment. You begin the game at ten health, and whenever an attack is rolled against you, you lose one of those ten health. If you ever get to zero health, you die, and therefore lose. Healing dice rolls get you one back. Attack rolls deal damage, while the numbers are ways to score points. Collect three of any given number, and you'll score that many Victory Points. Any additional matching dice score you one extra. So, four 1s gets you two points, four threes gets you four points. If you're in Tokyo (making you, at least temporarily, the King) you get to deal damage to all the other monsters on your turn. You're desperately trying to get attack rolls, to keep your opponents on the defensive. That's really important, because you're under attack from all sides when you're in Tokyo, and you can't count any healing rolls you get. The upside to dominating the skyline is that you score two Victory Points at the start of every turn you're there, plus the ability to hurt everyone else at once. When you're starting to run low on health, you can opt out of Tokyo, by ceding it to any monster who has just dealt you damage. This leads to some of the most entertaining dynamics in the game. You're sitting there in Tokyo, at maybe five health, really hoping that one of your opponents, who's only at three, will accidentally roll an attack roll, deal you one damage, and you can force them into Tokyo, where they will then become the target of the next player, who might be able to finish them off. There's a kind of delightful base cunning to the game. This isn't a game where thinking about 34 separate factors, at least 12 of which won't become apparent for another two hours, is going to get you results. A little bit of judicious ganging up here, a little bit of feigned weakness there, a big turn just when your opponents least expect it...the pleasures may be simple, but they're none the less real. Now, about these Energy cubes. Sitting beside the game board (which is really two spaces, representing Tokyo and Tokyo Bay, the latter used in the 5-6 player version) are three cards. They each have a cost in Energy cubes to buy, and then you generally keep them for the rest of the game, unless they're an instant card, in which case they're a one-hit wonder, and they're gone. The effects vary widely, and part of the fun of the game is in exploring which cards work best with which strategy. 'Acid Attack' for example, deals one extra damage each turn, even if you don't attack. That's great if you're trying to be aggressive, and a potential death sentence if you're low on health and you get put in to Tokyo. Buy 'Omnivore' for four Energy, and you get two Victory Points any time you roll a 1,2, and 3 on your turn. That's something you can accomplish with fair regularity with the two rerolls each turn, but at the cost of giving up a 'blockbuster' turn where you might get four or more attack rolls. The thing I like most about the game is that in what is a very small package and a very short time frame - we're talking 20-30 minutes even for the 5-6 player game - it manages to feel different every time. You get games where everyone is really aggressive. You get lucky games, where a succession of strange rolls lead to unexpected results. You have diplomatic games, with the players having much more say in what happens than the dice or the cards. There are games where you can assemble enough cards to make an 'engine' of sorts, generating extra die rolls which lead to extra energy which lead to more cards which lead to...There are games that are incredibly cagey, players creeping upwards along the Victory Points path. And then there are games where the winner only has 6 Victory Points, because everybody else is dead. King of Tokyo is great for Game Night. It has enough strategy to let really good gamers feel they're contributing to the outcome, but enough luck to give newcomers a chance. It's short enough to be played as a pipe-opener, or as the last thing before home time, but still long enough to feel consequential, and be considered in the 'who won what' totting up at the end of the evening. It's incredibly portable, and admirably passes the 'lunch at work' test. Not too many components, not a huge table needed, easy to teach, easy to learn, nobody gets upset when they lose...It really does have an awful lot going for it. And remember: to me, this is almost an abstract game, because the flavor doesn't hit the spot. If you like Godzilla, or Battle of the Planets, or Manga, or comics in general, or just like the idea of being a gigantic monster towering over the capital city of Japan (I suspect this last group is smaller than most of the others, but each to their own), then you're probably not going to think King of Tokyo is good.